It was a simple message of “hope” that made this skater kid from Charleston a household name. 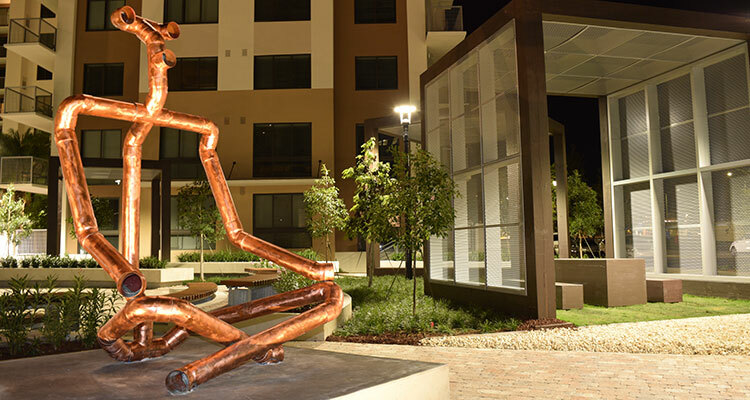 One of the greatest street artists of our day, Shepard Fairey continues to share images of humanity and social responsibility around the world—including right here in Jupiter. MLR: You recently completed a mural at Jupiter Community High School in support of the Perry J. Cohen Foundation. Why was it important to you to be a part of this project, and what was your process for coming up with the nature-based theme? 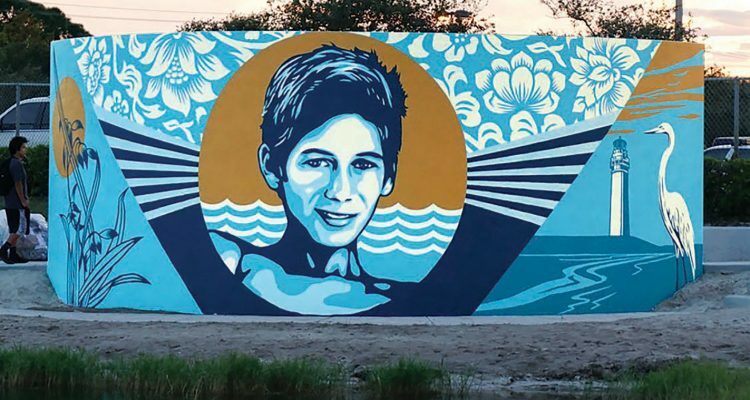 Shepard Fairey (SF): Nick Korniloff was an acquaintance of mine through the Miami art scene, and he reached out to me after his stepson Perry and Perry’s friend Austin were lost at sea. He asked if I would be interested in supporting the charity by doing an illustration or designing the PJCF logo. As a parent, I immediately empathized with Nick and Pam [Perry’s mother] and wanted to support them in any way possible. I also grew up on the water in Charleston, South Carolina, and spent a lot of time boating, so I related to Perry’s love of the water. The concept of the foundation as both a water safety and wetlands preservation organization was an easy thing for me to support. For the mural, I wanted to include the portrait of Perry in front of a background of water but also reference iconography the area is known for, including the egret and the lighthouse. Growing up on the South Carolina coast, I was familiar with a lot of the marsh plants and animals that are also common in Florida. I attempted to illustrate those things in my style, in the most iconic way possible. MLR: You started out in graphic design and making your own T-shirts. Can you recall the first piece of imagery you created that ended up on something—whether that was a shirt, a wall, a skateboard, etc.—that made you step back and think, Wow, that looks good… and inspired you to keep going? SF: I used to design and help screen-print the posters for school plays, and I remember seeing my poster for Oklahoma! all around campus when I was in seventh grade and thinking it was pretty cool that everybody was forced to look at something that I made. MLR: You emerged on the street-art scene with those Andre the Giant stencils; they were everywhere! Before you transformed them into a political message around former [Providence, Rhode Island] Mayor Buddy Cianci, people saw them as just an amusing, sort of punk/radical thing. What was your original goal with that stencil? SF: The Andre thing started off as an inside joke with some skateboard friends, but I quickly realized that an image in public that wasn’t government signage or corporate advertising was perplexing to people. I liked the idea of disrupting the usual semiotics of consumption. Even though the stickers and stencils started off silly, I realized that things could gain power just by being perpetuated and I liked the idea of self-empowerment through sheer will and repetition. Later, I evolved the images in a more sophisticated, political direction—but I give a lot of credit to the happy accident of beginning that sticker campaign. MLR: With the Andre stencil and even the Obama “HOPE” campaign, there’s a sort of grassroots effort involved in making a “thing” a thing. Andre took off because it resonated with people, who copied the stencil and plastered it all over the world. Most of those people were likely young adults, so basically it’s the youth who are deciding what spreads—it’s kind of like a meme going viral, really. That said, what do you think the difference is between spreading something online and taking art to the streets? Do you think an artist can make a name for himself simply by spreading his message online or is the tactile, visual, physical world essential? SF: I respond to tactile, physical things—that’s why I love to make prints, paintings, murals, clothes, stickers, etc. However, I use digital media because it’s a great way to put my imagery in front of more people. But as much as possible, I reference what I do outside of digital media because I do think that personal experiences with tangible art are valuable. I also think that where tangible art is placed can be very important, not only from an aesthetic or contextual standpoint but from a philosophical standpoint. I think that the average person should have outlets for expression available in public space, even if that means bending the rules. I think both creator and viewer benefit from experiencing art in public more so than through a phone or a computer screen. MLR: Bringing it back to Jupiter, how does it feel as a former skater kid from Charleston being asked to paint something that will affect and inspire high school kids, and what do you hope these students will gain from the wetlands project as a whole? SF: Even though I wasn’t a huge fan of school until I went to art school, I do think that education is extremely important. Equally as important is the emphasis on how we as humans fit into the world and have a responsibility to take care of it. If my art can increase the appeal of environmental responsibility, then I feel an obligation to do whatever I can. Art is only one facet, but an important facet of life and culture—and I want to support JERFSA [Jupiter High School Environmental Research and Field Studies Academy] in both its creative and broader curriculum. The Perry J. Cohen Wetlands Laboratory in Jupiter aims to carry on the noble mission of an admirable young man. When Jupiter teenager Perry Cohen disappeared at sea in July of 2015, his mother, Pamela, couldn’t help but mourn the dreams that departed along with him. “We have remained steadfast in the belief that Perry was meant to change the world,” she says. But it in her most difficult hours, simpler memories sustained her: his laugh, his “tender heart,” and his love for the local environment. Perry was thrilled when he was accepted to the Jupiter Environmental and Research Field Studies Academy at Jupiter Community High School. “Unfortunately, he went missing at sea two weeks prior to school starting,” Pamela says. To make sense out of their senseless loss, Pamela and her husband, Nick Korniloff, founded the Perry J. Cohen Foundation (PJCF), an organization devoted to advancing things Perry held dear: environmental, marine, and wildlife education and preservation; the arts; teenage entrepreneurship; and boating safety. PJCF’s latest project—the Perry J. Cohen Wetlands Laboratory and outdoor classroom—memorializes Perry at the high school he never got to attend. An existing water-retention pond is being transformed into a working laboratory and habitat, including a boardwalk, a dock, and a nature trail. The plan is for students to be able to utilize the area for study and learn about the environment in the environment, taking water samples and learning about various plant life. In December 2017, artist Shepard Fairey—best known for creating the iconic “HOPE” poster from Barack Obama’s 2008 presidential campaign—unveiled a striking mural incorporating Perry’s portrait at the site. Pamela says Fairey was one of her son’s favorite artists. To learn more about the Perry J. Cohen Foundation or donate to the wetlands project, visit pjcf.org.